Alvin Harper's best year came with the Dallas Cowboys in 1994, when he led the league with a 24.9 yards-per-reception average, catching 33 passes for 821 yards and eight touchdowns. Harper would play in Dallas for four years as the Cowboys went from the team with the worst NFL record to become back-to-back championships in Super Bowl XXVII and Super Bowl XXVII. 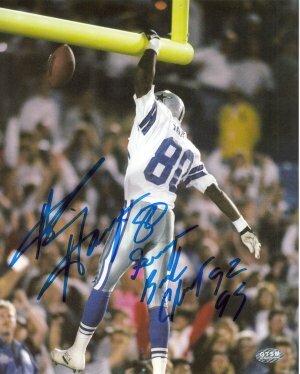 Alvin Harper has hand autographed this Dallas Cowboys 8x10 Color Photo with Super Bowl Champs 92 93 Inscription. Harper GTSM Hologram and Certificate of Authenticity from Athlon Sports.